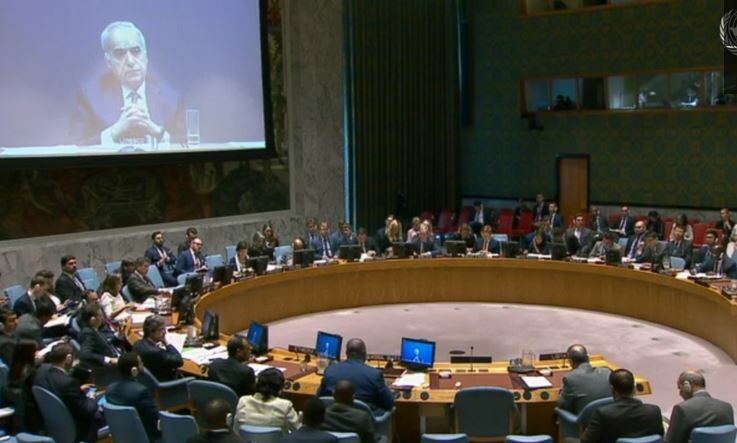 Ghassan Salame reporting to the UNSC on the latest situation in Libya said that he was abandoning his attempts to amend the LPA (Photo: UNSMIL). Reporting yesterday to the UN Security Council on the latest situation in Libya, SRSG and UNSMIL head Ghassan Salame, announced that he had finally given up on attempting to get the conflicting entrenched Libyan parties to amend the stalled Libyan Political Agreement (LPA) signed in the Moroccan town of in December 2015. This had been one of the main pillars of his 2017 Action Plan. Instead, Salame said that he was now pushing ahead for elections to be held by the end of 2018, subject to proper conditions. He said that there now exists a nationwide call for elections which was confirmed by the initial outcomes of the National Conference events. Salame called on the House of Representatives in consultation with the High State Council to deliver the necessary legislation for elections. The UNSMIL head also took a swipe at Faiez Serraj for intending to give unlimited powers to the Salafist Special Deterrence Force (Rada) militia which was recently criticised by Reporters Without Frontiers (RSF). I am grateful for this opportunity to brief you on our work in Libya. There are various ways to look at Libya, a country of some one million and half square kilometers. From one city to another, you will find reasons for concern as well as causes for hope. Though many cities and towns deserve to be cited, let me at least mention a few. Let me start with the capital. This month, Tripoli was struck by tragedy. On the 2 May, a murderous attack on the High National Elections Commission Head Quarters took 13 lives. The attack was claimed by ISIL. This attack is an attempt to derail the electoral process. However, despite the tragic loss of many staff, and the need to move to new premises after the suicide explosion damaged the building, the High National Election Commission Chairman has stressed their continued readiness to conduct elections. The perseverance of the Commission in the face of such adversity deserves our admiration. But positive developments also took place in the city. Elections for the Presidency of the High State Council were conducted on time, peacefully and democratically, bringing a whole new leadership to the institution, while reminding all that official positions are only temporary. More importantly for Libyan citizens, the Government of National Accord has agreed the 2018 budget. To the East, the city of Derna is subject to escalating ground, air and artillery assault since the 7 May, when Field Marshal Haftar announced an offensive by the Libyan National Army, Numerous civilians have been killed, while aid and medical access have been severely limited. Hundreds of families have been displaced. So far, most of the fighting has taken place on the outskirts of the city, we are concerned that if it proceeds to the urban areas, civilians will be in even greater danger. I urgently call on all parties to exercise restraint and to take all feasible precautions to protect civilians, and I strongly advise that the Council does likewise. The UN is working hard to address the humanitarian situation and is preparing in case the conflict worsens, and requests all actors permit unfettered humanitarian access and safe passage for civilians out of the area. We have formally offered and do so once more now the mission’s good offices to de-escalate the conflict. To the South, the city of Sabha s also suffered an alarming escalation in armed clashes. Fighting for control of strategic locations has led to rising fatalities, including many civilian casualties. The City Main Hospital has been subject of direct attacks, putting the infirmed at risk. Here, as in every instance where civilians are at risk, we stress to all parties their obligations under International Human Rights and International Humanitarian Law. Besides being the main city in Libya’s southern region, Sabha is a source of specific concern. First, because many agreements to stop fighting between the groups have been signed, then subsequently and repeatedly violated. Second, there is a serious risk that these clashes will deteriorate into an ethnic conflict. Third, because this conflict has the potential to become regional, given that armed groups originating from many neighboring countries have too easily transformed that part of Libya as their alternative battle ground. We therefore support rapid negotiations between Libya and its Southern neighbors, and we are wholeheartedly prepared to facilitate them if need be. The Sabha case demonstrates the need for Libya to work with southern neighboring States to secure its borders and resolve the matters of human trafficking, flows of fighters and smuggling goods. On a more positive note, forty kilometers to the West of Tripoli, on the 12 May, the city of Zawiya, the fourth largest in Libya, conducted the first municipal council election since 2015. In an open and competitive race, the local community supported by the municipal election committee have worked to ensure a peaceful and organized process, with national observers in every polling center. This successful election marks the start of a series of municipal polls that will take place across the entire country. Libyans have come to rely upon their Mayors and Municipalities for essential basic services, who in turn struggle to obtain the necessary resources to meet the needs. Hence, the importance of the renewal of local leadership. The United Nations has supported this election, both politically and materially, as we shall do for the forthcoming elections. Another city I will mention is Tawergha. This is a city that lost its inhabitants after a very serious conflict with the neighboring city of Misrata. They should have come back on February 1 of this year according to the plan of the Government of National Accord. They were forcibly prevented from doing so. Many have had to stay in the open, under rain and now under heavy sun. UN agencies have done much to make their conditions bearable. I have put on the table a plan to implement the 2016 agreement between Tawergha and Misrata. We are still pushing for its implementation. But Beyond the Twergha case, I am pointing to the more than 300,000 internally displaced persons of different political persuasions who long to go back to homes, in Benghazi or other cities. They were compelled to flee because of fighting or hostility from neighbors with whom they have lived with for centuries. The last city I shall note is the oasis of Ghadames, where citizens came together to paint the old town square in preparation for their National Conference event. Citizens shared their aspirations for their State and the principles which should guide it, their vision for a way out of the current crisis. 42 similar events have taken place in 27 locations across the country since the process was launched in April. Opening with simultaneous events in the eastern city of Benghazi and the western city of Zwara, the National Conference has spanned the country. Meetings have been held from Tripoli to Shahat, the western Nafusa mountains to the eastern Green mountains, the southwest border town of Ghat to the town of Qatrun in the extreme south; all without a single security incident recorded. Libyans from all political stripes and segments of society gathered to enter the political conversation, many for the first time with an enthusiasm that could not have been predicted. They have made it their own. Benghazi, after holding their National Conference, established 30 committees to follow-up. Cities have reached out to demand their own events. Local communities and officials have volunteered to organize their events. Even in the warring city of Sabha, the parties at conflict called a temporary truce so that the city could hold their National Conference. Special events are being held to focus on the concerns of women, youth and internally displaced persons. By the end of the process, events will have been held in over 40 locations for communities in Libya and residing abroad. I commend the thousands of people who have chosen to join the meetings, the municipalities and institutions who have hosted them, and thank the Centre for Humanitarian Dialogue which has organized the process. This series of events is the National Conference. Not a forum for select elites, but for all people. Once these meetings conclude at the end of June, the findings will be collected and shared at a special event in Libya, as well as with this Council. Some points of consensus from this large inclusive consultative process held in these various cities and towns have begun to crystalize. A yearning for a united and sovereign nation and a common belief that, to achieve that, the state must be more decentralized. An urgent need for a fairer, more transparent and effective distribution of public resources for the benefit of all citizens. A strong desire for unified state institutions, working transparently, with leaders selected based on their competency, not their identity. A unified, professional military and a coherent security apparatus, free from political interference, operating under clearly defined rules. A call for elections which can unite the country. And finally, a very clear longing to emerge from transition. This is why the advancement of the political process is so vital. At the core of the public mood is a strong desire of renewal of the political scene, the assertion of local power, and a return to a more normal life with more regular institutions. This has fueled their call for elections which has been heard increasingly loudly and clearly; through the Voter Registration update, within opinion polling, and now, during National Conference meetings. While elections must be held as soon as possible, the proper conditions must be in place. A new round of voter registration, prior commitment to accept the results, appropriate funds and strong security arrangements, are needed. No less important, the House of Representatives must deliver on its promise to produce electoral legislation for all forms of electoral events, in consultation with the High State Council. The Constitutional Drafting Assembly was democratically chosen in free and fair elections. Their proposal enjoys the legal majority required under the Constitutional Declaration, and a majority of the Assembly’s votes from each of Libya’s three historic regions. We have assisted the Assembly in their outreach efforts, to the Libyan people and the international community. However, on the current draft of the Constitution, Libyan views dramatically diverge. While many are keen to proceed directly to a referendum, others are dissatisfied with the text and call for its amendment, a return to a previous constitution, or specific guarantees, insisting that otherwise they will strongly oppose the organization of the referendum. The adoption of a constitution is a crucial moment in the life of a nation. It should not be a reason for more division, feuds or tension. The Mission will conclude its consultations with the widest array of Libyans possible in order to set an appropriate timetable for the people to democratically express their will, in either a referendum or national elections. I look forward to conveying the proposal at my next Council Briefing. At the conception of the Action Plan, the amendment of the Libyan Political Agreement was requested by various Libyan interlocutors. We have tried over and over, exploring different formula, attempting to reconcile various opinions, exploring means to accommodate ambitions. However, the parties are unwilling to make the necessary concessions. In my last brief, I stated that we would allow a last chance for these Amendments to come to pass, and they have not. Instead they have become a distraction. It is now time to turn this page. By focusing on elections this year, amending the LPA rapidly shrinks in importance. However, we must demand far more from the current Presidential Council in their final remaining months, both in terms of concretely preparing for elections, and providing services for the people. We never lose sight of human rights. In our two recent human rights reports, the first on detention centres and the second, due to be released tomorrow, on medical services, we have documented countless violations by armed actors against civilians. Further, the continued influence of armed groups upon politics and the economy is perilous, and unless resisted is in danger of expanding; as recently shown in a disputed decision by the Government of National Accord to give powers to an armed group, that can only belong to the sovereign state. To that end we have developed a new strategy to help Libya deal with the armed groups. For this, we have engaged the armed groups directly, in close consultation with the government. We are in the final stages of consultation with the Libyan authorities to finalize the strategy and form the plan for its implementation. It will not unravel armed groups tomorrow but will help the long process begin in earnest. Helping Libya tackle armed groups addresses one of the many challenges Libya faces in the security sector. There also needs to be a renewed push to build professional armed and police forces, including redoubling our own work. These efforts need to proceed in lockstep. With the passing of the budget, Libya’s wealth should flow to the people, and it must do so unimpeded and free of corruption. But with this year almost half gone, Libya must also look to its future. Subsidies remain unaddressed, as does the severe mismatch between the official and black-market exchange rate. Trafficked people and illicitly traded goods continue to flow through its borders. These facets provide opportunities for those few who sit at the heart of Libya’s political stalemate, plundering the nation’s coffers, resisting any actions which might challenge their predatory economy. It is this perverse economic model which must be shattered if the political process is to meaningfully progress. We are working to tackle these challenges, and accordingly in April, a special event was held on the margins of the Spring Meetings of the Bretton Woods Institutions in Washington DC. The efforts of Member States are vital, both in supporting the Libyan authorities manage their fiscal and monetary policy, but also in pursuing criminal financial behavior. But there are limits to what can be done unless there are unified institutions that have the strength to challenge vested interests and the credibility to introduce meaningful reforms. The social and political fluidity observed in the last briefing has continued to grow. It is a great pleasure to see Libyans from opposing factions meet and discuss amongst themselves; such as those between former regime groups in Benghazi or among representatives from Misrata, Tarhouna and Zintan. However, these meetings must be in pursuit of peace. We have also seen the welcome interest of Member States to support Libyans meeting with each other; in Cairo officers from all parts of the country have come together to try to unify their institutions, in Rabat when the Speakers of the two Houses met for the first time, or in Dakar where various groups of Libyans gathered to discuss their place in the political process. Such meetings have the capacity to be useful, but only when they are congruent with the Action Plan for Libya. The solidarity of regional organizations was high as expressed in the last Libya Quartet meeting held Cairo, as was the solidarity shown during the regular tripartite neighboring states meeting of Algeria, Egypt and Tunisia. I must thank the African Union, the Arab League, and the European Union for inviting me to brief their Member States, at their respective forums. I also want to express my appreciation to the African Union and European Union given our joint taskforce efforts in supporting the voluntary return of migrants’ home and improving, while still insufficiently, the conditions of the detention centres they are held in. Along with member states, we must continue our work with the Libyan authorities to improve the lives of migrants living in centres or in communities. The aspirations of millions cannot be halted by those few who wish to maintain the status quo for their own personal benefit. Parallel bodies that continue to exist beyond their mandate must be dissolved. Elections must be held. The country must move forward. But this can only be achieved with the support of this Council. When Libya hears conflicting messages, we only add to division and give opportunity to those seeking to derail the process. But when you speak with a clear and single voice, Libyans, believe you me, listen.